The company that I work for is undergoing some large restructuring. It may be that I could potentially lose my job due to their cost cutting. This is something that is completely out of the control of the employees and we just have to sit it out and see what happens. I already can see people from Human Resources booking large conference rooms for the whole day so things are bound to go down. To prepare for this I have reduced the rate I invest and am accumulating cash for any emergencies. I will still be using the cash accumulated in my employer's 401k to invest in dividend stocks since I cannot use this cash either way. However, my taxable account will have decreasing activity since most of my after tax cash will be held in my bank. On a side note, I am currently hoping that the utilities will continue to correct. They have decreased quite healthily over the last several weeks and utilities is a sector I want to be overweight in. My favorite trinity is Staples + Healthcare + Utilities for dividend stability, consistent growth, and predictability. I think large money managers are moving away from utilities and other high dividend paying stocks (such as consumer staples) and moving towards technology and industrials. This is a sector "shift" where fund managers cash in their profits and move towards other areas of the economy. I have noticed that these large money managers often change and rebalance their balance in the August and September months. As a result I hope the large selling would continue to go for the utility space since I have been wanting to add more to this category but it has been too overpriced. Names I am watching include SO, WEC, XEL, and NEE. The emergency fund is very important and I feel that the amount one should have stored up for emergency depends on your age and circumstances. Speaking for younger investors who don't yet have so much monetary responsibilities (a mortgage, supporting a family, lifestyle costs, etc) I think a 3 to 6 month emergency fund is reasonable. I myself am planning an emergency fund that will last me 6 to 12 months. At the moment I have around $11,000 in usable cash and were I to get laid off, I am estimating my severance to be around $20,000. A cash position of $30k should last me a year and during that time I can look for a job without worrying about going homeless. In the mean time, my monthly dividends and employment benefits can continuously purchase more shares to expand my portfolio. California's unemployment benefit checks will be able to help add more money to the amount I can invest in stocks every month. From my calculations, I will be able to get $450 per week for up to 26 weeks. With $1800 a month from unemployment checks plus $400-500 from dividends every month (this amount increases every month as my portfolio grows), I can add around $2300 to stocks every month while unemployed for 6 and a half months. I have paid an exorbitant amount of taxes over the last 3 years working in my job, and it is good to enjoy some of those benefits when times get rough. For those that are middle age and have larger monthly spending requirements, I recommend at least a year in emergency cash that cannot be used for investing. For those that are older and closer to retirement, if you cannot survive off your dividends or passive income, I would recommend having several years of expenses in cash. In addition to living costs, food, and other expenses, older investors need to calculate their expected medical costs every month while unemployed. I am a believer in always having medical insurance. A large medical emergency can completely destroy one's financial goals. More often than not, these medical emergencies are 100% out of the control of the individual. Those with money should enjoy the privilege of purchasing insurance and having that safety net in case things go really wrong. It is not worth penny pinching on health insurance. For my employer, they have agreed to pay for my health insurance for 6 months after I am unemployed. You can also continue using your employer's group health insurance plan under COBRA. COBRA is in effect up to 18 months. I am dripping into several stalwart dividend companies and then adding a new position in medical instrumentation supplier C R Bard Inc (BCR) and consumer staples company Clorox (CLX). Both are dividend aristocrats. The objective of this blog is to generate multiple sources of income to the point that the money flow is more than enough to support my annual expenses. At the moment, I am primarily reliant on my professional job to pay for my food, housing, and other bills. I take a large chunk of each paycheck and invest them in income generating assets. The focus of this blog is on dividend paying stocks with reputable track records. These are known as dividend aristocrats, companies that have paid increasing dividends to shareholders for the last 25+ years. The portfolio I hold emphasizes earnings consistency, anti-recessionary businesses, dividend consistency, and strong financial credit ratings. 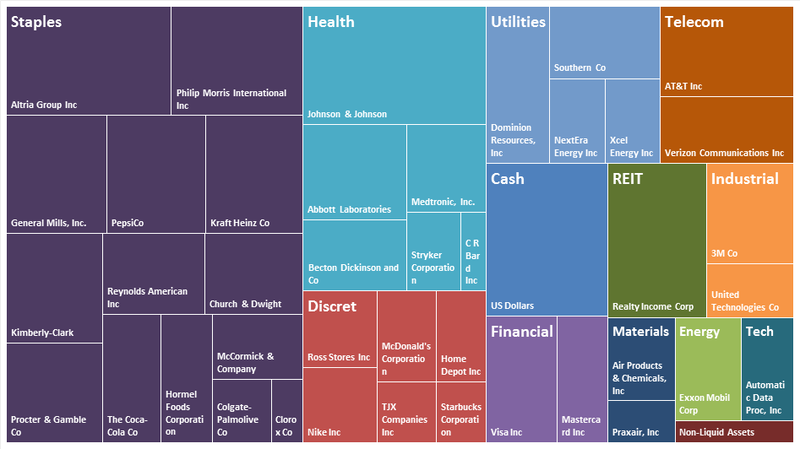 My favorite industries are in the Staples, Healthcare, and Utilities businesses. These businesses offer products and services that everybody needs in order to live a modern lifestyle. In recessions, people will still use the bathroom, eat food, and pay for electricity. I want to have income generated from these types of businesses since they have a higher guarantee on dividend safety and dividend growth. In the past recessions that have hit the world, many of the companies that have went bankrupt or nearly collapsed offer products that nobody "must have". These can include subprime lenders, restaurants, theme parks, movie theaters, coffee baristas, auto manufacturers, jewelry, and home builders. At the time that I am writing this post, the S&P500 has hit an all time high. 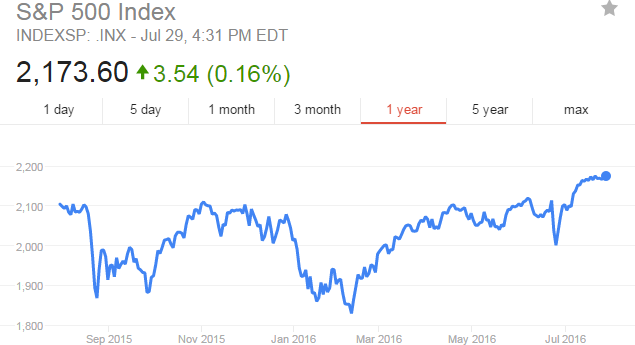 Even after the Brexit drop, the S&P500 was relentless in climbing back up. We have broke the resistance levels that have kept the market range bound for the last 2 years.